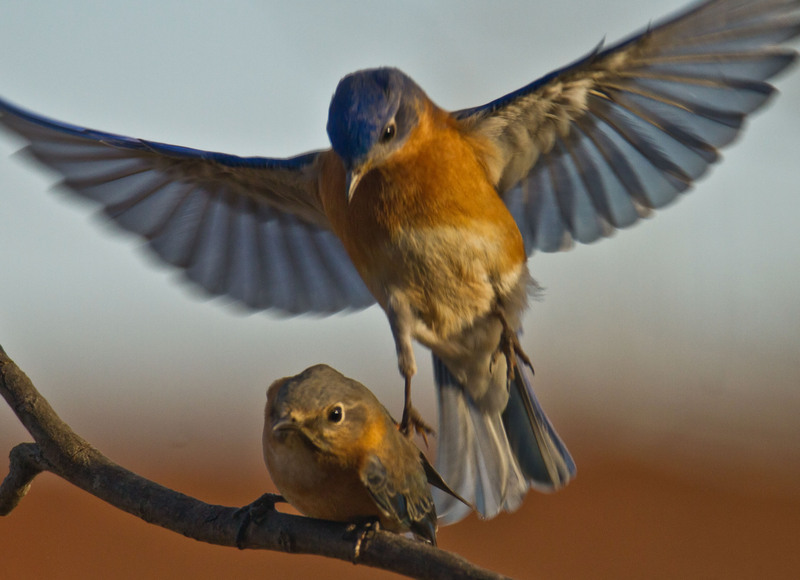 The bluebirds mating. Click to enlarge photos. maybe it was the weather. Maybe the fact that few insects were available. For reasons unknown to us of superior intellect, Mama knew it wasn’t time. Just in the last few days has Mama resumed her nest building efforts. This morning she is carrying in real fine grasses to line the nest. Almost completed. Just as everything seems to be going smoothly, a male House Sparrow shows up. I first saw him trying to get into a wren box I recently placed near the patio. Of course, he couldn’t get through the small hole so gave up and began eyeing up the bluebirds’ home. But, Daddy was on him. Both he and Mama have chased this interloper all morning. As soon as the first egg is laid, I’ll attach a Sparrow Spooker to the house. This is a great device to protect eggs and babies from HOSP’s. It shouldn’t be long before we have our first little blue egg. Why do you need to wait until the first egg is laid before attaching the sparrow spooker? 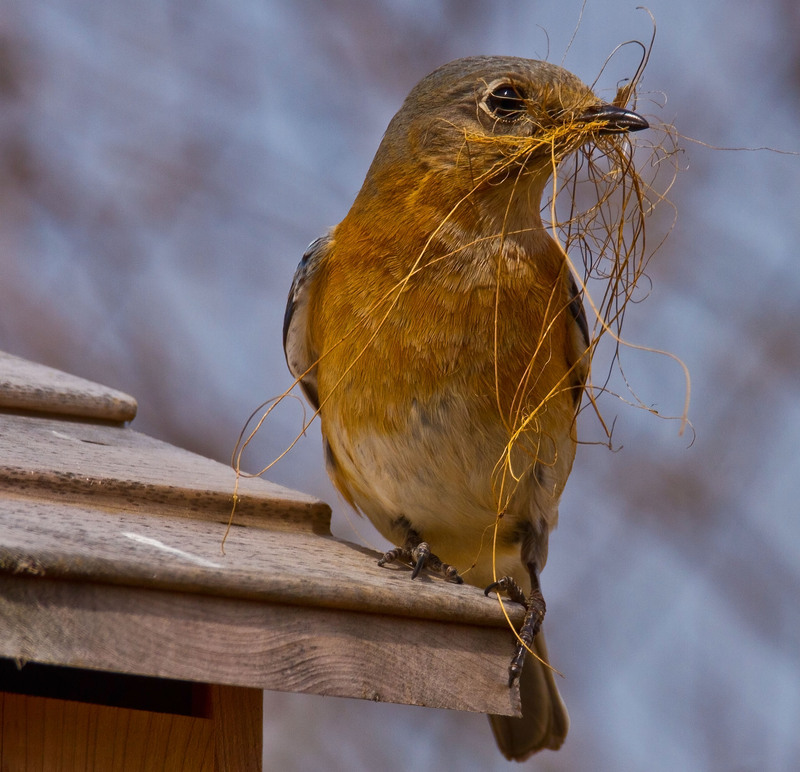 The bluebirds are also wary of the spooker, but once the female has the investment of the first egg her maternal instincts will overcome the fear. In a day or two they pay it no mind. Wow, 49 birds from your one nest. That’s wonderful. Keep up the good work! I was surprised, because here in Atlanta, mine have not even commited to a house with the recent snowstorms. Not too many “BLUEBIRD” days either. Keep your posts coming, though. I really enjoy them. Thank-you for the beautiful, crisp, bird photos.